We are halfway through 2015 and the year has definitely shown us a lot of trendy new styles that are making their way to the wedding seasons. Stylish lehengas in a variety of styles are all the rage, and we are seeing new trends making their mark. Let’s take a look at the top styles we have seen in the last six months and the ones which will make a splash in the rest of the year to come. 1. Gota patti: Gota patti is an embroidery design which uses appliqué to add some glitz and shimmer to an outfit. It’s an embroidery form that originated in Rajasthan and has been the hero of the bridal closet this season. The trend has taken over the ramps at all fashion shows and has also made its way to the real wedding functions. It can be teamed with any color to add some sizzle and sparkle to your style instantly. 2. Colors and patterns: This wedding season, it’s out with the typical wedding colors of reds and greens, and in with the fresh and bright pastel hues. Coral and mint have stood out as the most popular colors of the season in wedding wear. More and more brides are opting to liven up their outfits with more refreshing colors to add a unique spin to the traditional ceremonies. In terms of patterns, delicate and intricate florals are being favored over heavy zari and embroidery work. We can also see a lot of fusion of patterns with contrasting and mismatched blouses worn with distinctly different lehenga skirts. 3. Gold embroidery and mirror work: Delicate gold embroidery which is subtly incorporated in the design adds a regal elegance to the entire outfit. And teamed up with mirror work it adds that much-needed sparkle to a blushing brides outfit. 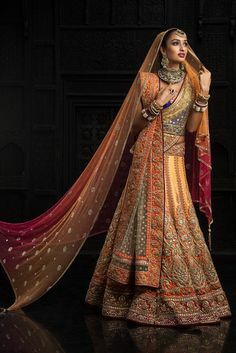 Many designers are using this technique to create embellishments around the neck of the lehenga and keep the rest of the outfit plain for a modest and appealing style. When teamed up with bright colors, this is one ravishing choice. Keeping it simple is sometimes to the most efficient way of making an outfit look stylish. 4. Sheers and raw silk: This combination, while more preferred in the colder seasons, is beautiful, elegant and charming while still being fun and flirty. Raw silk lehenga skirts with blouses made with sheer necklines and sleeves are a sight for sore eyes. It is a more rustic trend and looks great with earthy and organic colors like red, white, cream and orange.